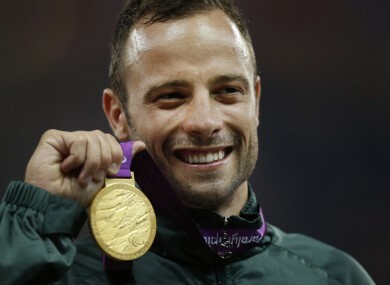 Oscar Pistorius with his gold medal after winning during the 2012 London Paralympics. OSCAR PISTORIUS WILL not be allowed to run in the Paralympics for the whole of his five-year jail term, even if he is released early under house arrest, a spokesman for the organisers of the event said today. “He will not be able to compete for five years. For us he would have to serve the whole term even if he was released early,” International Paralympic Committee spokesman Craig Spence told AFP. Pistorius, 27, was jailed for five years on Tuesday for culpable homicide over the killing of his girlfriend Reeva Steenkamp. A member of Pistorius’s legal team, Roxanne Adams, said Pistorius could be transferred to house arrest after 10 months. The South African, who was amputated below the knee at the age of 11 months, has won sprint gold medals at three Paralympic Games as well as competed in the 2012 London Olympics. He became known as “Blade Runner” because of his speed using carbon fiber blades. The next Paralympics are in Rio de Janeiro in 2016 but the organisers said Pistorius could only consider competing if his sentence was reduced on appeal. Email “Pistorius banned from defending Paralympic gold medals in Rio in 2016”. Feedback on “Pistorius banned from defending Paralympic gold medals in Rio in 2016”.